Here, I have declared a variable called myName. However, I have not assigned any value to it. I am using the null keyword with the equality (==) operator to check if the variable is null. Remember, a variable however, with a blank value is not undefined or null. The variable myName has a value (blank, I would say), but it is neither null nor undefined. 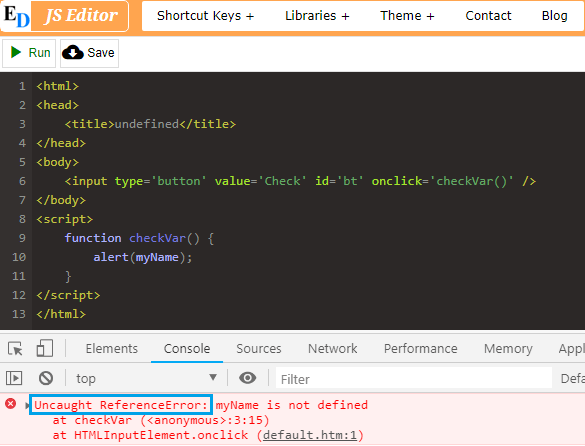 Your browser console may also sometimes show an error and would say, Uncaught ReferenceError: some_variable is not defined. See the bottom of the image. Don’t confuse this error with the undefined error that I have explained above. Both are different and have different meanings. In this case, I have not declared (or defined) the variable myName anywhere in my JS code. It does not know if it’s a string, number or a Boolean. So, to check if a variable is undefined or null, you must first declared or define the variable in your code.